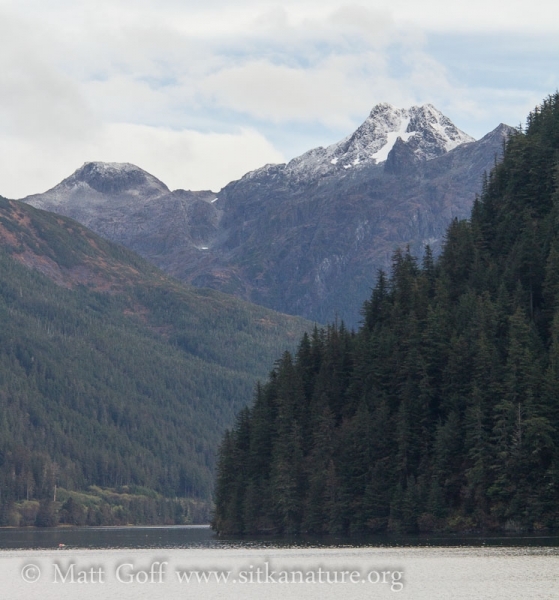 Cross Mountain (Cupola Peak on the maps) is a distinctive peak rising out of Silver Bay near Sitka. It’s been a subject of photographs for nearly 100 years (and perhaps more). My history taking pictures of it only goes back about 20 years, but I know of at least one E. W. Merrill photo featuring it (pre-1929, when he died), and there is an old Photoshop Studio picture from June 1st, 1939. Looking through my photos, I found one from 2006 that was close enough to the same perspective and season that I could align it with one I took this August, almost 12 years later. For a little context, I think 2006 may have been a somewhat cool summer. You can see a fair bit of snow remaining from the previous winter, but there is some older snow/ice exposed in this picture taken from Sawmill Creek Road in mid-September. 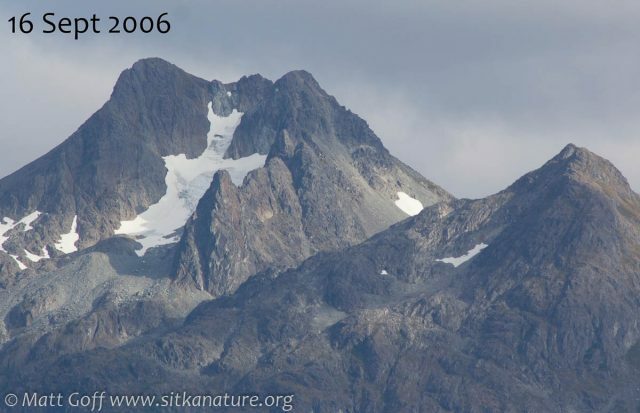 Winter of 2017-2018 was not especially warm in Sitka (especially compared to recent winters), but January through early April (when much of the mountain snow accumulates) was drier than normal, and as a result there was less snow than usual on the mountains as the season changed to later spring and summer. 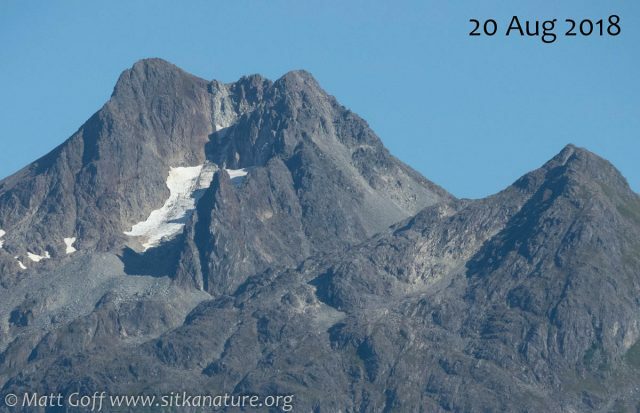 In this photo from 20 August 2018, despite being 3+ weeks earlier in the year, there is only a little bit around the edges that might be snow from last winter, otherwise it appears older snow/ice with lots of darker rock present as well. The 1939 photo I mentioned above was taken not far from where the two compared above were, though it was an early season (June 1st) photo, and the mountain is covered in an impressive blanket of snow, the cross nearly completely filled. Although there is a clear difference between 2006 and 2018 in how much snow/ice is filling the area that forms the cross, it’s much more dramatic to see how filled up the cross was back on the first of June in 1939. If I can figure out who to get permission from in order to post it (and assuming they’ll let me), I’ll see if I can put together a comparison of that photo with a more recent early summer photo. This entry was posted in glacier, historical. Bookmark the permalink. Very cool comparison Matt. Thanks for lining those photos up. One thing I find interesting about last year’s snow is that we got so little and friends in Ketchikan were skiing on 10 feet of snow in May. Much of central POW was snowed in very late. I don’t remember hearing about years with such a huge variation across our region. Matt, this is really interesting. Thanks, and thanks for the great radio as well. Thanks Rich, I appreciate the encouragement! Thanks Zach! I didn’t realize there was so much more snow in southern Southeast Alaska. It was certainly cold enough here to snow plenty in the mountains (unlike a couple of other recent winters), but I guess the storm tracks ran a little more south of us this year.